Dorothy Hayes, an award winning writer, has been a teacher, a journalist, a staff writer and a public relations director for a national animal protection organization. She and her husband live in Stamford, Connecticut. Her first love is her family including her husband, and four children, three inlaw children, fourteen grandchildren, and three greatgrand children. Upon leaving this role, she began writing her first novel, Animal Instinct. 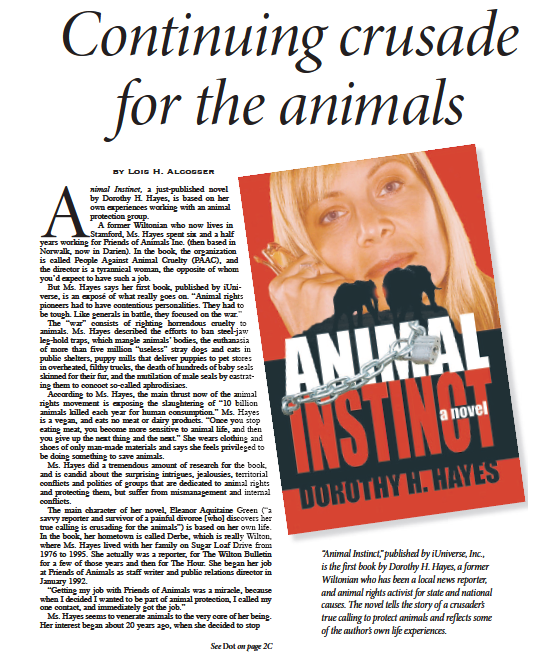 Animal Instinct was published by iUniverse in 2006 at which point Ms. Hayes began the promotion process. Now, Dorothy is marketing her three Carol Rossi Mysteries: Murder at the P&Z, Broken Window and Keys to Nowhere. Twenty years of living in Wilton made quite the impression on author Dorothy Hayes, who has recently released a second mystery novel with our small town at its core. Broken Window, named after the controversial policing strategy, is set in New York City in 1984 and focuses on three Wilton High School graduates’ first time in the city alone. Hayes will discuss her book at Wilton Library on Monday, June 8, from 6 to 7 p.m. The novel was published by Mainly Mystery Press in March. An author who draws on historical realities for inspiration, the setting of Broken Windows was especially important to Hayes. In the novel, three Wilton girls venture into crime-riddled New York City to visit NYU, where one of the girls will be attending college. On the first subway ride of the trip, two of the girls make it off the train, but the last is nowhere to be seen. “Her parents have no confidence in the NYPD,” so they enlist the help of a Wilton-based investigative reporter and her husband, a detective, the author says. Throughout the novel, Hayes keeps social commentary in mind, focusing themes on the tragedies associated with human trafficking, a problem that continues today. “The hallmark of my books is that they are believable, because they are framed with the social and economic statuses of the day,” she said. A longtime writer, Hayes was once a staff writer with The Wilton Bulletin and Norwalk Hour newspapers, but novels were always her passion. Even as a young child, she was the dedicated recorder of her and her siblings’ lives. “When I was a kid, if anything momentous happened, I was the one who had to write it down and tell everybody,” she said, smiling. Hayes’s previous novel, Murder at the P&Z, also features Wilton as a main driver, and contains some of the same characters. Though the positive response of her readers is a benefit of writing novels, Hayes says she still enjoys writing for writings sake. For information about her talk or to register: wiltonlibrary.org, 203-762-3850. Copyright 2011 Dorothy Hayes.Com. All rights reserved.